Home > Game Rules > Quick Game - Pizza Delivery! Quick Game - Pizza Delivery! Pizza Delivery! pays out when winning symbols match up consecutively from left to right on the same payline, as per the paytable. The player shall only be paid out on the highest win on any given pay line. 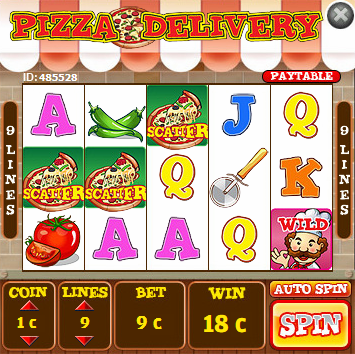 All wins occur on selected lines only, except scatter wins, which pay out anywhere on separate reels. Min coin size = 1c and Max coin size = $22.50. Thus, Min bet is 1c, and Max bet is $22.50. The line numbers will increment in multiples of 5, thus clicking here will either give you a setting of 5 or 9 lines. The Wild symbol substitutes for any other symbols, except the Scatter symbol. Any number of paylines may be used. 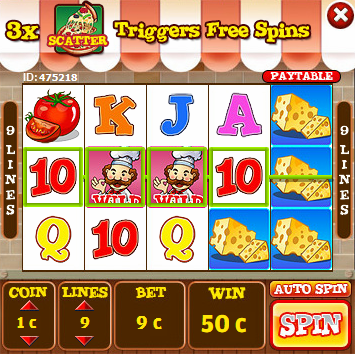 The player shall win a Scatter Pay award if he gets 3 or more Scatter symbols anywhere on separate reels. All scatter wins will be multiplied by the Bet. 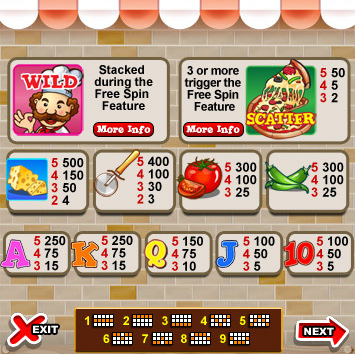 3, 4 Or 5 Scatters during a Free Spin round would increment the remaining free spins with 15, 30 or 100 spins. There is no limit to the number of times the feature can be re-triggered.